Another source for headphone deals? 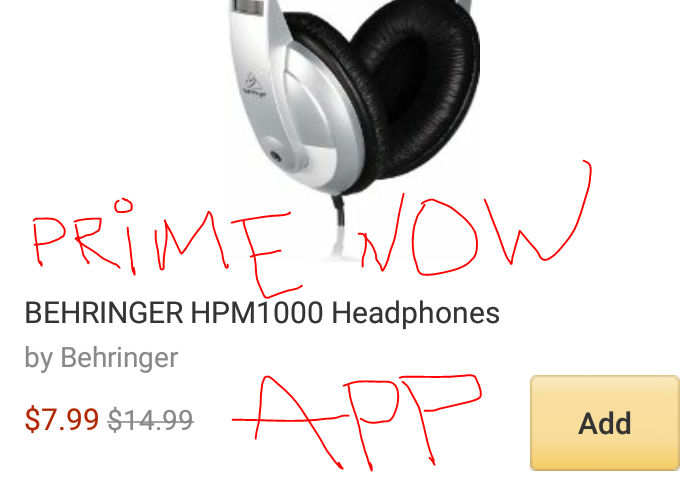 The Amazon Prime NOW App! The Amazon PrimeNOW service is a hyper local delivery service that offers product deliveries within two hours. It is available only to Prime members and only in zipcodes where the service is established (warehouses, drivers, etc are needed). In an attempt to make it more appealing to shoppers they added a “Weekly Ad” section within the app, and while browsing it, what a surprise, a headphone deal! The one you see above is the Behringer HPM 1000 offered for $8, while the price on the normal Amazon website is $10. So while this is not an exciting headphone, if they had one headphone in the ad, it suggests that others may join the party in the future. If you are not familiar with the PrimeNOW service, you can only make purchases through the PrimeNOW app (iTunes, Google Play, Amazon App store). You cannot make purchases using a computer or web browser or the “normal” Amazon shopping apps. More details at the Prine NOW page. Also note that product availability may vary by zipcode and region and state depending on when you check. This is because it is near instant delivery, so they will only let you buy items that they have available and ready for delivery. Unlike the regular Amazon website where the delivery time does not affect your ability to place orders.